The construction of an ICCA Vision must be determined by the communities in ways that are uniquely appropriate to it. It should develop organically, possibly during grassroots discussions, and without much external promoting or influence. Assessing the situation and building capacities are ways to take steps toward this vision. The revised Resilience and Security Tool for ICCAs has been designed to provide support for this process. Identifying and evaluating these elements may help in developing the vision of the ICCA’s desired future and an understanding of what kind of capacities it wishes to enhance. On the basis of that assessment, the community will be able to determine whether it wishes to receive external help, and of what kind. A simplified Resilience and Security Tool for ICCAs has been developed on the basis of feedback received from communities that used the original ICCA Resilience and Security Tool developed and tested by the ICCA Consortium in the early 2010s. 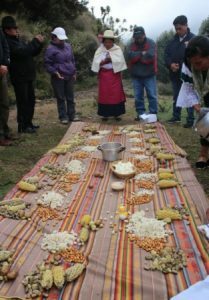 The new and simplified tool – which is included and described in Module 3 of: ICCA Self-Strengthening ICCAs – Guidance on a process and resources for custodian indigenous peoples and local communities, is to be used as part of grassroots discussions to assess the five ICCA building blocks listed above. While the tool offers a way to score an ICCA’s resilience (i.e., the capacity to fully recover after damage and effectively respond to the threats and opportunities it faces) and security (i.e., the likelihood that it will continue existing and thriving as an ICCA), its main aim is to help the community reflect and plan to fend off problems and threats and to respond positively to opportunities.